At 47?, the Nauti-Cat cuts through the water with a smooth, comfortable sail that first time sailors and longtime sail enthusiasts will enjoy. The 29? beam allows plenty of space for up to 43 passengers to relax on the nets or sight see from the high and dry decks and seating areas. An on-board bar with specialty drinks, two restrooms and a friendly crew will make sailing with Nauti-Cat the highlight of your vacation. Reserve Online or call (231) 947-1730 to save your spot! Nauti-Cat Cruises sails up to 4 cruises a day and is open 7 days a week. Our season is typically from Memorial Weekend to Labor Day, but we are often open before & after those dates. The cruises are typically 2? hours, except the Kids Cruise, which is 1 1/2. The Cat cruises in West Grand Traverse Bay. Depending on the wind speed, the Nauti-Cat is capable of traveling 14 knots. With 2 Heads (restrooms) aboard you can enjoy our full cash bar without being caught short. We carry complentary pretzels, potato chips, and chex mix but your more than welcome to bring any other food aboard. If you want to feel like a part of the crew, raising the sails, jibing, tacking, and driving, we will put you to work! While on the Nauti-Cat, you will see Traverse City from the best view, the water. Bring your camera, these photos will be unforgettable! Reservations are recommended & can be made up-to 14 days in advance. 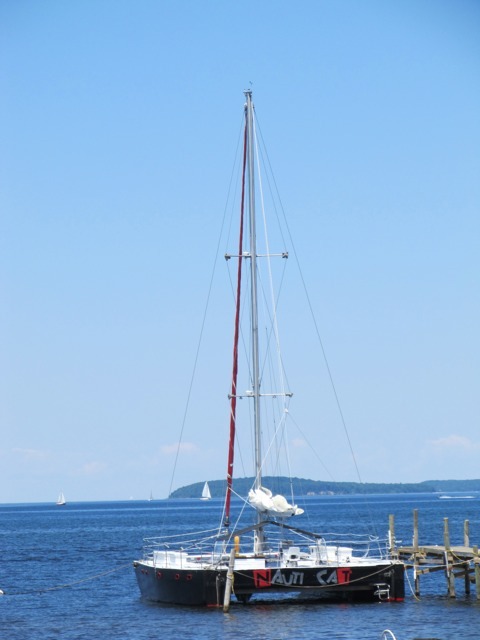 The Nauti-Cat now sails West Grand Traverse Bay in Traverse City Michigan 4 times a day, 7 days a week.